To experience trial version of HTML Converter, you can get installer of HTML Converter first, then install HTML Converter step by step with setup wizard. However, to obtain official version of HTML Converter, which is not limited with functions, please go to order page of HTML Converter. 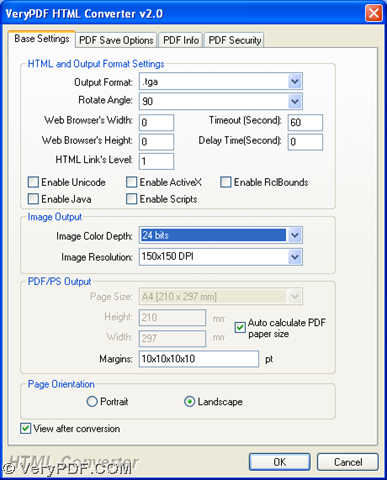 Then, one click on “setting” on GUI interface can help you set objective format as TGA with part of its properties: when you open setting panel on screen, you need to select tab “Base Settings” there > click “.tga” on dropdown list of “Output format”; to edit image bit-count as 1 bit, 8 bits or 24 bits, please click dropdown list of “Image Color Depth”; to edit resolution on X and Y direction, you can click dropdown list of “Image Resolution” in order to select one option there. After you finish your settings, please click button of “OK” so that those settings can be saved. 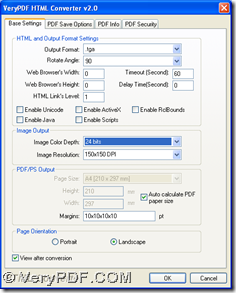 How to rotate the page when converting RTF to TGA? How to Convert PXL to TIFF? This entry was posted in VeryPDF Blog and tagged rtf to tga. Bookmark the permalink.